Joint Mission to Enquire into Industrial Accident at the Holcim – Ambuja Plant. Baloda Bazar District, Chhattisgarh. Mr. Dunu Roy, Hazards Centre. Ms. Gayatri Singh, Lawyer, Mumbai High Court. On 31st January 2013, five workers died in an accident that took place at the Holcim Ambuja plant at district Baloda Bazar, Chhattisgarh where an overloaded and dilapidated fly ash hopper crashed through five floors and five workmen were killed. These five workers included two permanent workers, one contract worker and two apprentices. The accident indicated gross negligence in maintenance of buildings and equipment, unavailability of trained personnel and mechanisms for rescue operations combined with the reported mistreatment by the plant personnel especially two security officers meted to the villagers who came to enquire about the accident and their family members who were working at the plant. The State Government announced compensation of INR 1 million to each family – however it has been shown that the Holcim led cement plants in Chhattisgarh have been violating local laws and disrespecting workers rights especially the rampant use of contract labour in the cement plants. With this background, mission visit was undertaken to Chhattisgarh from 15 – 16 February 2013 to meet with the local administration officials, labour department, health and safety inspector, chief inspectorate of factories, workers, union members, victims family workers and the plant management to gather information about the accident and its causes, to ensure that such an accident does not happen in future by putting necessary safeguards in place, and also address key issues faced by the workers at these plants especially the insecurity of employment in case of contract workers. The mission members met with the district collector and joint collector and the interaction covered various aspects of the accident and related matters. The Collector gave a brief background of the plant before coming to the accident. This plant earlier belonged to the Modi group and was established in year 1984 – 1985. The loss making unit was restructured under the management of the Ambuja group. There are two units in the plant – Line 1 has been there since 1984 – 85 when the ownership was under Modi Group and Line 2 has come up recently when Holcim took over the ownership of the plant. The accident took place in line 1 of the Holcim – Ambuja plant around 10.40 AM on 31 January 2013. The collector’s office was informed within 10 minutes of the accident and the first team reached the plant at 11:45. The first body was discovered at 12:30 PM and it took about 56 hours to complete the entire rescue operations and take out five bodies. As per their information,on 1st floor there were two workers and on ground floor there were three workers including contract worker and the two apprentices. The Collector mentioned that the plant was not equipped to deal with such scale of accidents – relief and rescue operations and did not have the capacity to deal with such level of disasters. In fact, the management looked up to the district administration for carrying out rescue operations. The rescue personnel were called from the nearby cement plant, Ultratech and cranes were brought from Lafarge. The Collector expressed considerable discontent at the way plant security officers handled the villagers and mistreated them, further the management was not able to give a statement or disseminate information from inside the plant to the outside – their public relations department was not adept for handling this public interface. This also created resentment among the villagers who wanted to know about their family members. He was surprised to note that CCTV was available only at the production site and not at the personnel department – he said that had the CCTVs were there, live feed could have been provided from inside the plant which would have pacified the crowd and media gathered outside the plant. The fly ash hopper collapsed possibly due to structural failure which could have been inherent at the commissioning stage itself. It was a steel structure and there was a lack of space to work around. Five workers who died in the accident included three workers from outside the state – 2 from Uttar Pradesh and 1 from Madhya Pradesh, the remaining two were from local villages. An engineer by profession, the Collector shared that the cause of the accident could be attributed to poor design at the commissioning stage. In 2005, the hopper was retrofitted to the existing structure i.e. it was an old structure with an added new design. The reason being cited as overloading may not be the exact cause for this accident to happen. The fact that the accident could have been prevented or at least rescue operations could have been hastened makes the accountability lie on the side of the management. The delegation also asked about accountability with the enforcement machinery – the Collector mentioned that they are looking into it especially the work of the factories inspectorate. The Mumbai based design company has been asked to justify that their design was not at fault. Another question asked pertained to facilities under the Factories Act – we were informed that there is one hospital in the residential area. In May 2012, site appraisal was done in cement plants and selected plants (boiler section of associated power plants, there have been cases of boiler explosion there certificates were not valid) were shut down for one month at Ambuja. However, efforts were made to check and inspect largely the movable parts and machineries and not the static structures – hence it has been a major learning for the administration as well. Further, he mentioned that the company has in-house safety committees and it is necessary that these committees also have worker and union representatives. The Collector mentioned that post accident, his office had convened a meeting of all cement plants in the district on 6th February 2013 and issued a list of recommendations and has stipulated three months period for initiating action on these recommendations i.e. 31st May 2013. He further informed that the period of magisterial enquiry has been extended to 31st March 2013 – an open ended enquiry that is doing evidence collection – and representations are welcome from different stakeholders on the accident and related issues. The collector mentioned that they are enquiring from workers whether there was vibration which was not incidental. On discussions pertaining to contract labour raised in the meeting – when figures and statistics were provided by the delegation, issues and data were put forth. The Collector highlighted that the management employs migrant workers and not from the local villages – about 90% of contract workers are from Uttar Pradesh, Bihar, Jharkhand and 10% are from local villages.Unions shall have more clout when workers are from the local area(s). The company also did not have proper system of accounting for number of workers working in the units. 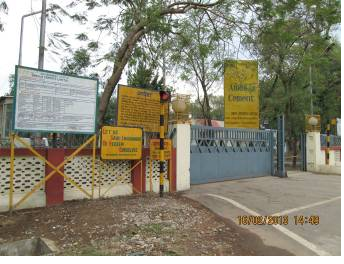 On the issue of the increasing proportion of contract workers and ascertaining the number of workers at the plant, the Collector mentioned that it is being proposed that the Identity cards presently issued to the workers by the contractor(s) shall also be signed by local labour officers so as to keep a parallel record of workers and avoid mismatch for coverage under the Provident Fund and ESI. The issue of unregistered contractors at the plant was also highlighted. He also added that directions shall be issued to the management as to which areas the apprentices can work in, as the accident affected two apprentices working in the cement mill. Taking in apprentices is part of the Corporate Social Responsibility (CSR) activity, but the location of their work needs to be ascertained. The Collector also added that the administration shall also focus on improving the local hospitals in terms of capacity to take in critically injured persons and provide emergency relief to them. 1. Every three years, all the cement plants shall get their plants fully inspected – this inspection can be done through any IIT in India. If the cement company gets the inspection done through any international or national agency, an IIT shall have to engaged to certify the outcomes of the inspection and copies of the inspection report shall also be submitted to district administration and other concerned Government departments. 2. Every cement plant to have one disaster management committee / public safety committee which should have plant head, all unit heads along with office bearers of the different trade unions active in the plant. Regular monthly meetings shall be organised and analysis of the OHS situation along with any minor or major accidents needs to be undertaken by this committee. Monthly meetings report shall be submitted to the concerned police officials as well. 3. Relief and Rescue Group for handling accidents and similar situations to be constituted in every cement plant. Regular training, safety tools and necessary rescue equipments need to be provided to these groups. 4. CCTV camera to be installed in all cement plants where workers enter and exit in production/ other units. Every cement plant needs to have a list of workers to ascertain how many workers are working at a given time in the different wings of the plant. 5. Apprentices and trainees cannot be made to work at dangerous units/ sites and management shall have the responsibility to ensure the same. 6. Every cement plant to get at least two of their senior officials trained in handling industrial accidents from National Institute of Disaster Management. The Regional Labour Commissioner (RLC) informed the delegation that because of his engagement elsewhere he has deputed Assistant Labour Commissioner (ALC), in whose jurisdiction Ambuja plant falls, to provide relevant details. About the accident, the ALC shared that enquiry by the factory inspectorate is ongoing and the report is awaited. The ALC mentioned that contract labour and workmen’s compensation came under the purview of Central government and the provisions under Factories Act came under the jurisdiction of the State government. About the burning issues facing the cement industry i.e. contract labour – he provided details on the number of regular workers (431), contract workers (2264) and the number of contractors (44) at the Ambuja cement plant. There has been a discussion that the company management should also endorse and certify the ID cards for each of the contract workers working at the plant. On the issue of contract workers being denied their benefits, the ALC promised to look into them if the cases were brought to him. The ALC seemed to be not very well informed about the case and legal aspects pertaining to contract workers. Commenting on the improvement in the Contract Labour Act, he proposedselected reforms to be made viz. a) establish a clear distinction between core and peripheral activities, b) include equal payment for same and similar work done in the statute itself and c)provisions for reinstating the contract workers. Meeting was conducted with the Deputy Director, Industrial Health and Safety (who also holds the charge of the Deputy Chief Inspector of Factories) at the State Capital, Raipur. This meeting was attended by Bro. Dunu Roy and Bro. Ashim Roy. Their observations from the meeting capturing the health and safety issues at the Holcim-Ambuja plant are annexed (please refer to Annexure-1: Health and Safety). The delegation visited the plant where this accident happened. The delegation was received by security officers, Mr. Y.P. Singh and Mr. Nandlal Choubey and they informed that a meeting is going on hence it would not be possible to meet anyone from the plant management. Further, it was mentioned that the Ambuja has already issued an official statement clarifying their position. And it was told to try for meeting on the next day i.e. 16 February 2013. Day II started with meeting the union officials from PCSS and INTUC office bearers and workers including Bro. Suresh Bagre (INTUC), Bro. Mahesh Kumar and Bro. Kalyan Patel from the PCSS. Attempt was also made to meet the management on the second day however the delegation was told that the concerned management officials including the plant head Mr. B.C. Pandey and the HR person, Mr. Tiwari were not available as they had a meeting to attend at Mumbai and this was despite the assurance for a visit given by the Sub-Divisional Magistrate (SDM), Mr. Motwani and the management never called back. To gather more details about the accident and also the structure and design plus hopper placement in the area where this accident took place, interactions were held with selected workers from concerned departments. The team perused various documents that had been submitted by the representatives of various unions to the Collector and Sub Divisional Magistrate in respect of the industrial accident. a) That the structure supporting the fly ash hoppers was weak and was continually subjected to vigorous vibration when the fly ash was conveyed by pipe under pressure. In fact we were informed that the high powered Engineering Support Group of the company had pointed out this structural weakness about 2 years ago and no action had been taken subsequently. b) That the Safety Committee was ineffective and owing to the Management nominating only the representatives of its favourite union headed by Shri Rajulal Shrestha, the serious concerns of the workmen could never get properly taken up. c) That on the fateful day Shri Suresh Chandra Shukla, who was on the post of Shift Electrician, but whose B Form was filled up as a mines worker, had been asked to carry out maintenance of the motor of the cement mill, which was not a part of his duty. The apprentices were allocated to him as helpers in violation of the provisions of the Apprentices Act. d) That the Management behaved in a most callous manner with the family and co-workers of the victim workers, refusing them information, locking them out of the gates and even using force and intimidation against them through their Security personnel. Some persons were even being asked to falsely testify that one worker had been taken for treatment to Raipur, whereas the reality is that all the workers died more or less immediately. e) The Management failed to deal with the accident scientifically and the act of using water to douse the hot fly ash- cement mix was a serious mistake since it caused the mixture to set rendering it even more difficult to extricate the trapped workers. It was also understood that the FIR was initially registered under section 287 and 337 of the Indian Penal Code (with very minor l punishment and as a bailable offence). In this manner offence was lodged against three officers, however they were granted bail on their personal bond. Additionally, the delegation was informed that now the case has been registered under 304 A and copy of the report is being sought because 304 II should have been applied in this case. Visit was also undertaken to the families of the deceased workers in village Arjuni – Mr. Roshan Lal Verma and Mr. Poshan Lal Verma who worked as apprentices at the plant. Roshan Lal Verma is survived by wife and 15 months old child. Brother of the deceased worker, Mr. Jaswant mentioned about the highhandedness of the security officials who instead of showing compassion to the families of the deceased and other villagers used unwarranted force that further aggravated the situation and the emotions. Also, there was no information from the company and they got to know about Roshan’s death through media. The other details that were given were about the payment, as an apprentice they were paid a monthly stipend of around 1,950 INR and there was no particular work/ area assigned to them. The family additionally mentioned that they have been promised that the 15 months old child shall be provided free education up till college level. At Poshan Lal Verma’s home, we met with his mother, youngest brother and grandmother. The family was in a state of shock and did not say much about the accident. The family mentioned that it was the last day of Poshan’s one-year apprenticeship and he should be treated as a qualified worker and be given additional compensation by the company as per the Workmen Compensation Act. Both families urged that necessary urgent steps should be taken that such an accident does not happen in future. The Deputy Director, Industrial Health and Safety, Raipur (who is also the Deputy Chief Inspector of Factories), showed us the preliminary report submitted by one of his Inspectors that gave the dimensions and location of the hopper that collapsed, and workers at the factory shared their observations about the accident and the structure. Since we were not provided an opportunity by the management to inspect the site, the following represents the best possible interpretation of the available data about what might have caused the accident. The cement mill in question belonged to the Modi enterprise in 1985 when the raw material feed for manufacturing Ordinary Portland Cement (OPC) consisted of 95% clinker and 5% gypsum. It should be noted that clinker is produced by sintering limestone at high temperatures with clay (which may already be present in the limestone) in a kiln. This is then ground in a ball mill with gypsum which both facilitates the grinding as well as prevents the flash setting of the cement. In 1990, the mill changed its feed mix to 65% clinker mixed with 30% slag and 5% gypsum for the manufacture of Portland Slag Cement (PSC). Slag is a by-product of the process of smelting iron and was earlier considered to be a waste, until cement manufacturers found it could be used to supplant limestone and, therefore, cut down on the cost of production as well as could be used to produce concrete that was more resistant to chemical attack. In 1995 the cement factory was bought over by Ambuja and in 2005-6 by HOLCIM. It was then that there was yet another change in the manufacturing process and the feed was changed, in accordance with environmental stipulations, to make use of yet another waste material from the thermal power industry, fly-ash, which now supplanted the 30% slag to make Pozzolona Portland Cement (PPC). This also requires very fine grinding of the cement. Consequently, a second Line and ball mill were constructed on the ground floor of the existing factory. Above the flat roof of this floor, a large steel frame structure was constructed on the pillars of the old structure to accommodate three hoppers of 160mT, 90mT, and 40mT capacity that would supply fly-ash to the ball mills, along with other ancillary equipment. These three hoppers were situated one above the other and the fly-ash was lifted from the silo at the ground level to the highest hopper through a pipe that carried fly-ash fluidised by a blast of air. The fly-ash was then released to the lower hoppers and, eventually, the ball mill, through gravity feed by operating a series of gate valves. It was the highest (and largest) hopper that collapsed during the accident – bringing down with it the smallest one) and, therefore, our attention is focussed on it. This had a capacity of 160mT, was 6000mm in diameter and 5491mm high in its cylindrical portion, with a further conical portion at the bottom which was 3300mm high and the cone had a slope of 8º. This gives a volume of roughly 120m3 and with a bulk density that varies between 1100-1500kg/m3 (depending upon compaction), the total amount of fly-ash that the hopper could contain would range from 120 to 180mT. According to the workers as well as the Dy. Dir. (IH&S), the hopper had two sensors that would automatically start and stop the pneumatic feed at 125mT and 145mT. This largest hopper was mounted in the superstructure at a height of 35.9m and what was apparent both from the report of the Inspector as well as the account of the workers, was that it was not supported on pillars with strong foundations in the ground at the bottom, as such hoppers usually are (see Figure 1) with 4, 6, or multiple pillars depending upon the load to be carried. Instead it had a collar of 6800mm outer diameter at 2000mm from the top and this collar was 1000mm broad and attached to the beams of the superstructure in an unspecified manner and mounted on 3 load cells. This gives a very unusual mounting indeed and can only be surmised, from the descriptions given, as being something like in Figure 2. A suspended hopper, as shown in Figure 2, is not supported from the ground by pillars that are under compression (as In Figure 1) but on cantilever beams that are under shear or torque. Hence, it is inherently weak in its support function. Since the beams are also not attached to columns on both sides because of the triangular support on load cells, they are under greater stress. Also, it was reported by workers that none of the joints were riveted or bolted for additional strength, but only welded; hence, the support structure is further weakened. It also appears that the load sensors, which are normally used to detect deformities in load bearing structures, were, in this case, being used to measure the total load in the hopper, so could not be relied on to detect any early signs of imbalance or failure. In addition, the thick cover of fly-ash dust on the joints did not permit visual observation of cracks. Workers also reported that the pneumatic feed into the hopper was a source of considerable vibration. Given the pressure drop from the bottom of the silo to the top of the hopper, there was also the chance of choking of the feed pipe that would add to the vibration of the structure. (The two workers who were at the top were reportedly trying to unclog the pipe by hammering on it at the time of the collapse.) All these would have combined to prevent early risk assessments from being made. When the Dy. Chief Inspector was queried about the regular inspection of the factory he said that his department had 10 Inspectors currently who were required to do 800 inspections per year for the 4223 factories that were registered in his area. (A request for 11 more Inspectors has been forwarded to the Public Service Commission for consideration.) Hence, the best the Inspectors could do was a walk-through visit and depend on the data provided by the managers. Clearly, therefore, the regulatory mechanism is barely functional in the district. On the other hand, the factory is certified under ISO 9001, ISO 14001, and OHSAS 18001, and these independent certification authorities should presumably have been able to check and ensure the quality of the plant from end to end. ISO 9001, for instance, requires that the personnel performing work affecting product quality should be competent on the basis of appropriate education, training, skills and experience. The company is supposed to ensure that its personnel are aware of the relevance and importance of their activities and how they contribute to the achievement of the quality objectives. The company is further mandated to determine, provide and maintain buildings, workspace and associated utilities, and process equipment, while managing the work environment needed to achieve conformity to product requirements. However, much of the certification is based on “self-assessment” by the management. ISO 14001 focuses more on environmental issues, but the certification requires assessment of the competence, training, and awareness of personnel, as well as emergency preparedness and response plans. A process must actually exist for identifying the potential emergencies, in addition to planning and mitigating them. The company is also required to review the emergency procedures and make improvements as necessary, as well as engage in periodic testing of emergency procedures. Most critical are the provisions contained in OHSAS 18001, wherein the company is required to devise an OH&S policy; plan for hazard identification, risk assessment and determination of controls; plan for emergencies and responses; devise procedures for performance measuring, monitoring and improvement; provide and ensure the appropriate use of safety equipment; and train in order to introduce an OH&S culture and establish the importance of the organisation’s safety statement, policies and objectives. Implicit in this is that a lead senior manager should be in charge of the OH&S system and, at the same time, employees should do the jobs that are suited to their competencies. The company must also periodically and regularly conduct internal audits to identify non-conformities and address them. However, from all accounts, much of the operation was being conducted by contract workers, helpers, and trainees. Safety too was being supervised by the security officers rather than by properly trained senior managers. And the company had to apparently wait for assistance to be provided by other factories in the neighbourhood before it could deal with the emergency, with the last body being taken out from the debris after 52 hours. In conclusion, it may be inferred, on the basis of available information, that not only was the failure implicit in the design of the structure, based on cost-cutting measures, but that there was an equal failure of the inspection, certification, and regulatory mechanisms that are supposed to cumulatively and collectively ensure safety at the work site. As per Section.16 of the Apprentices Act, the Employees’ Compensation will apply to apprentices covered under it in case of an accident. Section2(aa) of the Apprentices Act defines an apprentice as “person who is undergoing apprenticeship training in pursuance of a contract of apprenticeship”. However, for all apprentices not covered under the Apprentices Act, the ESI Act (as amended in 2010) will apply under Section.2(9)(iii) of the ESI Act “…or any person engaged as an apprentice, not being an apprentice engaged under the Apprentices Act of 1961 and includes such person engaged as apprentice whose training period is extended to any length of time…” This therefore also includes apprentices under Standing Orders (who were excluded prior to the 2010 amendment). In Premier Ploytronics v. Assistant Regional Director it was held that whether a person is an apprentice or employee depended not on the nomenclature but on the nature of work done. The Employees Insurance Court will have to come to this conclusion on the basis of evidence. In case of a dispute, apprentices are also covered under the ID Act. “But if an apprentice does “any manual, unskilled, skilled, technical, operational, clerical or supervisory work for hire or reward”, he will be a workman to whom I.D. Act will apply and, therefore, will not be governed by the Apprentices Act, even if he was enrolled as an apprentice trainee. It is not the label a person has, but the type of work which he does, which is relevant criteria for determining as to whether he is or is not a workman” as was held in LIC of India v. D.J. Bahadur. “The line of demarcation between the apprentice and the workman is very clear. If and when a question as to whether an apprentice is really an apprentice or is a workman wearing the mask of an apprentice, is raised, the appropriate authority/ Labour Court will have to apply mind to the nature of his work. The veil has to be lifted in order to find out the reality. But such a question cannot be decided merely on the basis of apprenticeship contract or on the basis of the label, which a person wears”, as held in Ram Dular Paswan v. P.O. Labour Court. Therefore, depending on the nature of apprenticeship the Employees’ Compensation Act or the ESI Act will apply to those among the deceased five who were apprentices. But they are definitely covered. Employees of the Ambuja Cement Plant in Balodabazar are covered under the ESI Act, their official websites says so. Section2(9)(ii) r/w s.2(13) of the ESI Act makes it applicable to contract workers. The ESI Act applies to the exclusion of all others under Section.53 of the Act. Therefore, the families of the contract workers among the five deceased will benefit under this alone. It is pertinent however that the Cement Wage Board Agreement which is applicable to Ambuja Cement, has specified that no contract labour shall be employed in the cement production process except for the processes of loading-unloading and packing wherein the wages paid should be the same as for the regular workers. Permanent/ regular workers in the cement industry are paid as per the Cement Wage Board which is inclusive of various allowances including heat and dust allowances. State v. Niyabji – there was an ex-gratia payment made under a government scheme. This was held to be in addition to the payment under the Employee Compensation Act/ESI Act. Thus the payment made/ announced by the Chief Minister was through his relief funds/other funds and is therefore in addition to legal entitlements. Relevant Provisions of the Factories Act. (2) Where in any factory the plant or machinery used in a process such as is referred to in sub-section (1), is not so constructed as to withstand the probable pressure which such an explosion as aforesaid would produce, all practicable measures shall be taken to restrict the spread and effects of the explosion by the provision in the plant or machinery of chokes, baffles, vents or other effective appliances. (b) the necessary equipment and facilities for extinguishing fire. (2) Effective measures shall be taken to ensure that in every factory all the workers are familiar with the means of escape in case of fire and have been adequately trained in the routine to be following in such cases. (3) The State Government may make rules, in respect of any factory or class or description of factories, requiring the measures to be adopted to give effect to the provisions of sub-sections (1) and (2). (4) Notwithstanding anything contained in clause (a) of sub-section (1) or sub-section (2), if the Chief Inspector, having regard to the nature of the work carried on in any factory, the construction of such factory, special risk to life or safety, or any other circumstances, is of the opinion that the measures provided in the factory, whether as prescribed or not, for the purposes of clause (a) of sub-section (1) or sub-section (2), are inadequate, he may, by order in writing, require that such additional measures as he may consider reasonable and necessary, be provided in the factory before such date as is specified in the order. (1) If it appears to the Inspector that any building or part of a building or any part of the ways, machinery or plant in a factory is in such a condition that it is dangerous to human life or safety, he may serve on the occupier or manager or both of the factory an order in writing specifying the measures, which in his opinion should be adopted and requiring them to be carried out before a specified date. (2) If it appears to the Inspector that the use of any building or part of a building or any part of the ways, machinery or plant in a factory involves imminent danger to human life or safety he may serve on the occupier or manager or both of the factory an order in writing prohibiting its use until it has been properly repaired or altered. If it appears to the Inspector that any building or part of a building in a factory is in such a state of disrepair as is likely to lead to conditions detrimental to the health and welfare of the workers, he may serve on the occupier or manager or both of the factory an order in writing specifying the measures which in his opinion should be taken and requiring the same to be carried out before such date as is specified in the order. (1) Where in any factory an accident occurs which causes death, or which causes any bodily injury by reason of which the person injured is prevented from working for a period of forty-eight hours or more immediately following the accident, or which is of such nature as may be prescribed in this behalf, the manager of the factory shall send notice thereof to such authorities, in such form and within such time, as may be prescribed. (2) Where a notice given under sub-section (1) relates to an accident causing death, the authority to whom the notice is sent shall make an inquiry into the occurrence within one month of the receipt of the notice or if there is no such authority, the Chief Inspector cause the Inspector to make an inquiry within the said period. (3) The State Government may make rules for regulating the procedure inquires under this section. (1) The State Government may, if it considers it expedient so to do, appoint a competent person to inquire into the causes of any accident occurring in a factory or into any case where a disease specified in the Third Schedule has been, or is suspected to have been, contacted in a factory, and may also appoint one or more persons possessing legal or special knowledge to act as assessors in such inquiry. (2) The person appointed to hold an inquiry under this section shall have all the powers of a Civil Court under the Code of Civil Procedure, 1908 (V of 1908), for the purposes of enforcing the attendance of witnesses and compelling the production of documents and material objects and may also, so far as may be necessary for the purposes of the inquiry, exercise any of the powers of an Inspector under this Act; and every person required by the person making the inquiry to furnish any information, shall be deemed to be legally bound so to do within the meaning of section 176 of the Indian Penal Code (XLV of 1960). (3) The person holding an inquiry under this section shall make a report to the State Government stating the cause of the accident, or as the case may be, disease, and any attendant circumstances, and adding any observations which he or any of the assessors may think fit to make. (4) The State Government may, if it thinks fit, cause to be published any report made under this section or any extracts there from. (5) The State Government may make rules for regulating the procedure of inquires under this section. Save as is otherwise expressly provided in this Act and subject to the provisions of section 93, if in, or in respect of, any factory there is any contravention of the provisions of this Act or of any rules made thereunder or of any order in writing given thereunder, the occupier or manager of the factory shall each be guilty of an offence and punishable with imprisonment for a term which may extend to two years or with fine which may extend to one lakh rupees or with both, and if the contravention is continued after conviction, with as further fine which may extend to one thousand rupees for each day on which the contravention is so continued. Provided that where contravention of any of the provisions of Chapter IV or any rule made thereunder or under section 87 has resulted in an accident causing death or serious bodily injury, the fine shall not be less than twenty-five thousand rupees in the case of an accident causing death, and five thousand rupees in the case of an accident causing serious bodily injury. Explanation. – in this section and in section 94 “serious bodily injury” means an injury which involves, or in all probability will involve, the permanent loss of the use of, or permanent injury to, any limb or the permanent loss of, or injury to sight or hearing, or the fracture of any bone, but shall not include, the fracture of bone or joint (not being fracture of more than one bone or joint) of and phalanges of the hand or foot.